Expanding the length and complexity of sentences is something that SLPs love to work on well beyond the ‘early communicator’ phase, something we talked about a few weeks back. 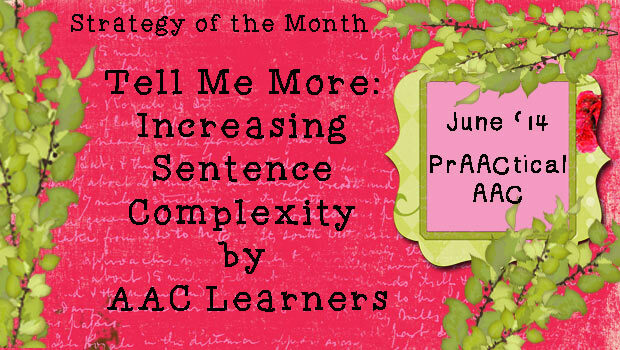 In today’s post, we’ll consider ways to build more complex utterances for learners who are gaining competence with their AAC systems but who still use language that is immature, imprecise, or overly simplistic. In many ways, this therapy is like language therapy for any other learner with delays in grammar, syntax, and morphology. Indeed, we sometimes forget to activate all that we know about language intervention when working learners who use AAC. We try to use that as a starting point and adjust for the AAC components as needed. Here are some of the things that we think about when planning therapy for AAC learners who are trying to strengthen their ability to speak in more complex sentences. Relate the language goal to their personal goals: Why work hard at something you don’t care about? Like the rest of us, AAC learners are the most motivated when the task leads to something we care about. We are most successful when we find a way to link what WE want as SLPs, to what THEY (and their families) want for their own lives. Can I tell you about something? I forgot to tell you this. When you have time, I have something to tell you. Better yet, brainstorm some conversation starters with your AAC client. Once the conversation is up and running, we have a perfect venue for increasing sentence complexity. Consider working on conjunctions: Teaching conjunctions is a very effective way to lengthen sentences and make them more complex. I know that most of us learned FANBOYS, but we generally start with these conjunctions: and, because, but, or, before, after, if, so. Although not necessarily in that order [pun intended]. Use the ‘Perfect Pause:’ And then we wait. We look interested (we ARE interested! ), and wait expectantly. 5 seconds, 10 seconds, 15 seconds, or more. It depends on what your AAC learner needs, but the idea is that we are creating a space for them to realize that they need to say more. Building longer, more sophisticated utterances is a process that takes time but is an investment worth making. Are you working on goals like this with your AAC learners? We’d love to hear the strategies and approaches that are working for you.